Alan Kelly has thrown his leader down the gauntlet and called for a change of leadership. ALAN KELLY HAS once again thrown his party leader down the gauntlet this week stating that he believes a change in leadership is needed. The Tipperary TD told his local radio station on Friday that the party needs radical change and that Howlin should reflect on his position. Hitting back at his party colleague, the party leader said there is no appetite for a change of leadership within the parliamentary party. However, in recent weeks pressure has been mounting on Howlin since a large number of councillors signed their name to a letter calling for him to stand down. With the party’s think-in taking place in a couple of weeks, some believe it could be curtains for Howlin. If so, how does the party go about electing a new leader? Well, the rules on that front have changed very recently. The last time there was talk about the leadership, Kelly was searching for a nomination from his parliamentary colleagues. However, despite getting elected in 2016, Kelly didn’t enjoy the same support from his depleted cohort of Leinster House colleagues. 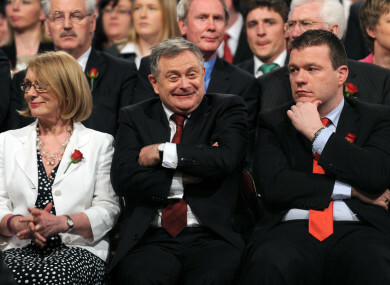 Failing to get any of his fellow party members to second him for nomination as leader of the Labour party, Brendan Howlin was elected. At the announcement in Dublin’s Royal College of Physicians, there was one notable absence in the room. Alan Kelly. However, the party changed the rules at the party’s conference last November. It is no longer the case that a TD needs to get the nomination by a member of the parliamentary Labour Party. The rules do still stipulate that only members of Dáil Éireann are eligible for election (which rules out senators that might have their eyes on the job) . A candidate must be nominated either by getting at least two people (which may include the candidate) who are members of a House of the Oireachtas to back them or there is now the option of the person getting at least five Constituency Councils, whose members constitute at least 10% of the constituency party membership on their side. If there is more than one candidate, a poll must be held. However, the job can only be filled if there is a vacancy and Howlin is still the leader of the party. The only way he can removed from office is if a motion of no confidence is passed with the support of not less than two-thirds of the membership of the Central Council. Notice of such a motion must be sent to the General Secretary of the Labour Party at least two weeks before the day on which it is to be debated. If a vacancy arise, the Executive Board and the parliamentary party, meet in a joint session not later than 15 days after the vacancy to elect someone to serve as acting leader until such time as an election can take place. One interesting aspect of the rules is that in the event of a general election or of “any other contingency considered by it to be of national importance” the Executive Board has power to postpone, for no longer than three months, the holding of an election of a new leader. Since Kelly took to the airwaves, members of the parliamentary party have been coming out in support of Howlin, showing that not much has changed in their minds since Kelly sought their support for the leadership in May 2016, only to be left out in the cold. While Kelly said the letter from councillors was not his instigation, the new option of getting five constituency councils on his side appears to be the road he is going down. The party’s think-in in Drogheda in mid-September could be the scene of the showdown. Email “What would need to happen for a new Labour leader to be elected?”. Feedback on “What would need to happen for a new Labour leader to be elected?”.